Classic beauty, modern technology. In the tradition of the classic power cruisers of the 50’s and 60’s, the 55 classic provides a combination of classic lines with the best of today’s modern technology. A carbon fiber deck is utilized to reduce weight while providing maximum strength, easy maneuverability is provided with joystick controls (with either optional Volvo IPS OR with standard drives), a Seakeeper stabilizer provides stability both while under way and while dining at anchor, and state-of-the-art electronics (Raymarine glass helm technology with multiple touch screen controls) provides easy access to all systems. The advent of the “lobster” boat brought with it a refined aesthetic that lent something of a sailboat sensibility to power boats, i.e. lower houses and sleeker lines. However, living space became something of a casualty. 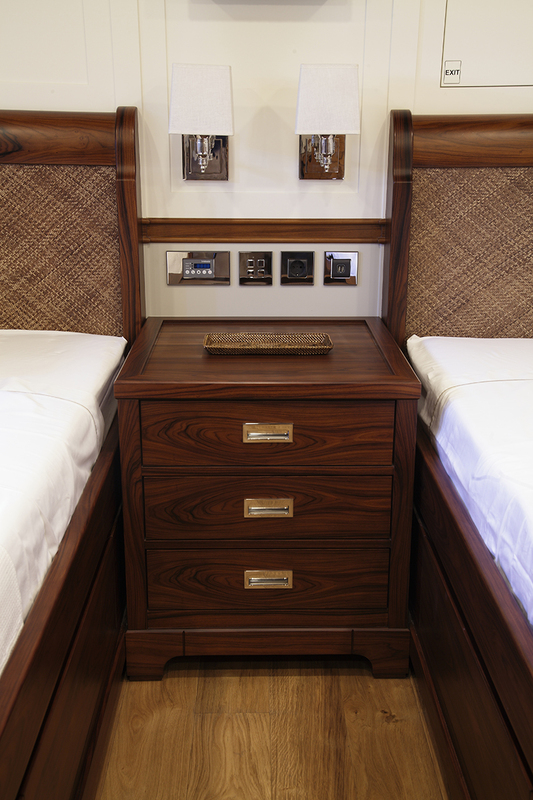 The classic 55 provides the type of live aboard space – 3 staterooms and 3 heads – that are typical in much larger yachts. The saloon is private with plenty of light , the open galley includes a functional dinette to starboard, and the master stateroom is what a master stateroom should be, beam to beam in the most comfortable (and largest) part of the boat, instead of a master stateroom in the bow with steps required to get into bed. For all of that, there are no compromises. A large comfortable cockpit with a removable sun awning (carbon fiber poles easily stow), a massive mid-ship engine room (where the weight of the engines provides optimal balance), and great sight lines for steering from a very comfortable helm station. As with all of the Reliant Yachts fleet, we can also customize to owner’s specifications, which is as it should be for yachts of this size and pedigree. For more information on the Classic 55 or any of Reliant Yachts fleet, contact us today.